However, due to this lack of understanding and grappling with the ramifications of this doctrine most Christians view God in the abstract and as a result have a detached and almost deistic relationship with the God of the Bible who is actually transcendent and immanent in our world. In this book the author seeks to bring about a new revitalization to the church and its witness to the world by having a deeper understanding of the Triune God as revealed in the Scriptures. 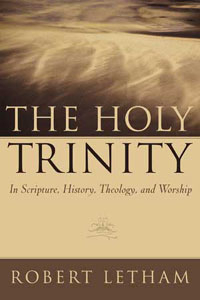 In this very cogent book Dr. Letham seeks to give a broad overview of the Triune doctrine by canvassing the Scriptures, church history, modern discussions with contemporary theologians of the past few centuries (their orthodox and unorthodox views), and Critical Issues – including the incarnation, worship, prayer, missions, and union with Christ. This book is a challenging read, but I think Dr. Letham maintains a good balance between the scholarly aspects of the discussion and its practical applications – which ultimately lead us to worship. Many of the chapters end in prayer and focus on actually worshipping God, not just discussing Him. Two excellent articles reviewing books by Gilbert Bilezikian and Kevin Giles on the Trinity conclude the work as appendixes. A helpful glossary and bibliography conclude the work. I am grateful to the Triune God of Scripture for Dr. Letham’s excellent contribution to theological reflection in this book. It is a readable and comprehensive study of the doctrine of the Trinity in the unfolding revelation of the Bible, in its breadth of reflection from church history, amid the loci of influential systematic theologians, and in the life and application of the evangelical community. I think anyone will benefit from reading this book. It will definitely sharpen your understanding of the Triune God we worship and inform and influence the way you relate to Him in your daily life.